The hosts are already qualified for the Top 16 of the Eurocup while the away side will be keen to do the same with a win in this game. However, the final rankings in the group are still up for grabs, which should spur the hosts on and the away side may have qualified before the game begins depending on the scoreline in the earlier Group D game. All of which means it is difficult to say how important this game is until it actually gets started. One thing that Ulm have in their favour, aside from home advantage, is the fact that they grabbed a massive in Russia in the previous clash between these sides this season. They managed a 62-77 triumph which means that even a narrow loss would leave them ahead in the head to head clash between these sides. This won’t come into Ulm’s thinking unless the game is really running away from them but it should provide them with confidence coming into this game. There is also the fact that Raymar Morgan has been in good form this season, offering an average of 12.7 points per game this season. The Russians may not need to win to book a spot in the Eurocup Top 16 but they will want to avenge their earlier defeat. The loss to Ulm was a thumping at home and this should inspire them to up their game and deliver a strong showing in this game. Taylor Rochestie has been the player most likely to score for Lokomotiv so far this campaign, providing an average of 14.6 points per game, and he uis the only player in double-figures for the side from Krasnodar. This could be one of the closest games in the Eurocup this week and the bookies don’t think there is too much between these sides. 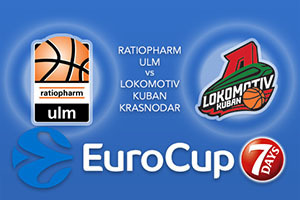 Take ratiopharm Ulm at -1, which is provided at odds of 1.90. If you are looking at the Over/Under market for this game, you should choose UNDER 158.5 which is provided at odds of 1.90. Bet Now!